This annual event provides a forum for conservation leadership and brings together more than 700 leaders from fish and wildlife agencies and conservation groups from all 50 states, U.S. Territories, Canada and Mexico in order to discuss conservation policy and management issues and accomplishments. 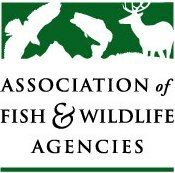 Attendees include key decision makers in the field of fish and wildlife, including; directors, assistant directors, program managers, and others involved in fisheries, wildlife habitat, law enforcement, legal affairs, industry, as well as public affairs (information and education). Highlights of the event include collaborative committee and working group meetings, thought-provoking Plenary Session, recognition of outstanding achievements at the Awards Banquet, Welcome and Reception, and plenty of social and networking opportunities. Sponsor and exhibitor registration is open! Multiple opportunities are available. Sponsorships are sold on a first-come, first-serve basis. Learn more about how you can get involved! Related meeting requests are now being accepted for committees and working groups, universities, organizations, agencies, and others interested in holding a meeting or social function in association with the 108th AFWA Annual Meeting. Requests are due June 3, 2019. Download the related meeting request form. Attendee registration will open in June. Check back soon for pricing! Mark your calendar now for the 109th AFWA Annual Meeting! We'll be in Saint Paul, Minnesota at the InterContinental Saint Paul Riverfront Hotel September 22-25, 2019. View dates and locations for other upcoming AFWA Annual Meetings here. THANK YOU TO OUR 2018 AFWA ANNUAL MEETING SPONSORS!